How do you reboot a classic? How do you take one of the greatest cult TV shows of all time and present it in a new format that is both relevant and respectful? 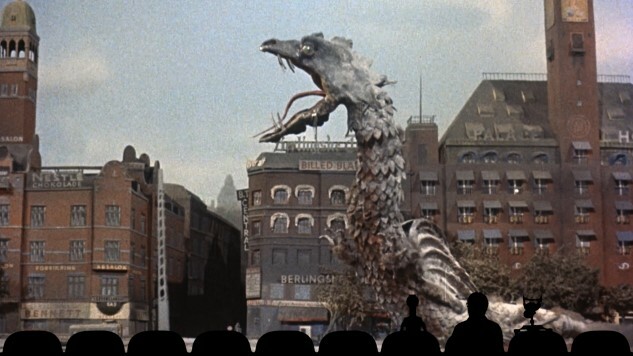 How do you keep the MST3K in a new version of Mystery Science Theater 3000? How do you please the sort of fan who would write a 47,000 word ranking of all 177 original MST3k episodes, as recently appeared on Paste? After watching two preview episodes of Shout! Factory’s new MST3K series on Netflix, I can report the following: The show’s new creative team is off to a strong start in what is officially being called “season 11.” Both episodes, Reptilicus and Cry Wilderness, have some rough patches and aspects that can still be refined, but we’re talking about a reboot to a series that also tended to vary wildly in its comic sensibilities and ability to execute them from episode to episode. MST3K has always been both variable and extremely subjective, and the show’s first two episodes prove no exception. Before we dive into the Reptilicus premiere, allow me to run through how this new series chooses to establish its presentation. — New host Jonah Ray is playing “Jonah Heston,” another Gizmonic Institute employee in the mode of Joel who is captured by Kinga Forrester (Felicia Day) and TV’s Son of TV’s Frank (Patton Oswalt, also known simply as “Max”) and shot up into the Satellite of Love. He’s joined by the robots that any fan of the show would know: Tom Servo (Baron Vaughn), Crow T. Robot (Hampton Yount) and Gypsy (Rebecca Hanson, who also plays kooky Pearl Forrester clone “Synthia”). Jonah is brought to Moon 13 in the show open. — The new opening sequence/update to the MST3K Love Theme is absolutely knocked out of the park by band leader Har Mar Superstar, who has been a Paste/Daytrotter favorite for years—truly an inspired choice that I didn’t see coming. He leads the “Skeleton Crew,” who function as Kinga’s grunts/house band. At one point they’re clearly playing a riff on the “Wild Rebels Cereal” theme from Ep. 207, Wild Rebels, which filled me with delight. — This truly is considered a continuation rather than a true remake. All the previous characters such as Joel, Mike and Dr. Forrester still exist in this shared universe, and the opening labels the episode as “198,” which means they’re including the 22 original episodes on Minneapolis local station KTMA (but not MST3K: The Movie). The KTMA season is apparently “season 0” as a result. — Just watching the credits for Reptilicus, you can mine a whole lot of interesting information. Writing credits include the likes of Dan Harmon and Justin Roiland of Rick and Morty, Patton Oswalt’s brother/fellow comedian Matt Oswalt, and former MST3K writer and oft-time supporting actor Paul Chaplin, among others. Joel Hodgson is credited all over the place: Writer, director (along with Robert Cohen), and actor as “Ardy,” who I’m assuming is one of Pearl’s henchmen, but I can’t exactly place who he is, which means he’s probably masked. — Many aspects of the Joel era, such as the Invention Exchange, have returned relatively unchanged. Jonah’s invention in this episode is the geisha-esque “bubble fan,” which isn’t particularly memorable. For their first episode back, the show presents us with a giant monster movie that would have fit in nicely alongside the Gamera and Godzilla-rich episodes of seasons 2 and 3. I can only imagine that their goal was to find a film that would be perceived as “vintage” MST3K, in a comfortable genre that would immediately put fans of the show at ease. Few genres are more suitable to that purpose than giant monster movies, given the aforementioned Gamera and Godzilla, not to mention Gorgo, The Giant Gila Monster, The Beginning of the End and so many others. The only real twist with Reptilicus is that the film is actually from Denmark—they shot two versions at the same time in both English and Danish, as in the famous case of the English and Spanish versions of Tod Browning’s Dracula. The plot is very simple. A team of unlucky miners strike monster rather than oil while drilling into a mountainside, bringing up a chunk of severed, frozen tail. Defying all known natural laws related to biology and conservation of matter, the man-sized tail chunk somehow regenerates and grows into a giant reptile the size of a skyscraper. From there, it unfolds exactly as you’d expect, with a bunch of military and scientific personnel trying to stop the rampaging, rear-projected monster. That’s it for plot. The effects are atrocious, even for the only giant monster movie in Denmark’s history (I can’t imagine why they never made more). Reptilicus himself exists in what is seemingly an entirely different dimension of stock footage, and any scene with the monster on screen has a noticeably lower quality film stock. Occasionally, he’s rear-projected behind people running away, spitting neon green bile at the camera in the style of a ‘50s first-gen 3D feature, despite the fact that this movie is not in 3D. The few times he eats some unlucky person, it looks like he’s chowing down on an animated guy from A-ha’s “Take On Me” video. However, the riffing also feels a little scattershot at times, driven by its own insistent pace. Never have I listened to the rhythm of an MST3K episode and thought “there actually might be too much riffing here,” but the thought did occur to me a time or two during Reptilicus. I imagine that this is a function of trying to keep the show relevant and modern—to cram in as many jokes as there can possibly be, and feature tons of guest writers—but riffing also requires moments to breathe and a little faith in the audience’s attention span. This is still a 90-minute show, after all. There are too many times in Reptilicus when an unrelated joke follows half a second after a previous one, without giving the first any chance to register with the audience. In doing so, there are times when good riffs are undercut and less effective than they might be. Looking at the fan reaction on forums such as the primary MST3K subreddit, where many former Kickstarter backers have had an opportunity to watch episode 1101, this seems to be an emergent, if minority, criticism. But at the same time, I think there are aspects of the in-theater presentation that will likely be refined in future episodes. The voicework demands a note—although all three performers sound fine individually, their three voices aren’t nearly as distinct from one another as any of the Joel or Mike-led lineups, where it’s very easy to tell who is speaking at any given time. That is significantly harder here. In its current form, Crow’s voice is probably the most distinctive, containing some of the reedy quality and a bit of the innocence of Trace Beaulieu’s take on the gold robot. Jonah is next easiest to pick out, as his voice is usually the deepest of the three. Through the first two episodes, it’s Servo who I’m most routinely having difficulty parsing, which will probably get easier over time. There’s one more change in presentation that factors into the vocal confusion at times, which is the size of the seats and silhouettes—something I really haven’t seen discussed elsewhere. In the original MST3K, the row of seats is between 6 and 7 in length, and the riffers are occupying a fairly substantial amount of the screen. In the new widescreen MST3K, on the other hand, the dimensions have gotten much larger as a result (a full 10 theater seats across), which means the riffers occupy much less of the screen—similar to MST3K: The Movie, but even smaller in appearance. Whether this is more a factor of modern TV screen dimensions/aspect ratios or a desire to make the riffers take up less of the screen I can’t say, but it makes the viewer less likely to notice smaller movements from each robot that help indicate which is speaking. Perhaps this is why the riffers also seem to be more active in moving around the theater now, although it’s not always entirely obvious why they’re doing so. One area of the new series that has already exceeded my expectations, though, is the host segments. It seemed to me that these might be the most difficult area to recapture the spirit of MST3K, but if anything they’re the most unabashedly fun part of Reptilicus. The song “Every Country Has a Monster” (written by Paul and Storm) is a showcase for Jonah’s perspicacity and vocal dexterity, which is quickly matched by Yount and Vaughn in a way that surprised and delighted me. It has the good-natured attitude, geeky deep-diving references and outstanding visual aids to make it a match for almost any song in MST3K history, which is saying quite a lot. Needless to say, a song like that bodes very well for the rest of the series. All in all, Reptilicus has its ups and downs, but it’s not difficult to welcome this episode into MST3K canon. Better yet is the fact that episode 2, Cry Wilderness, is even better, which makes me antsy to binge on the entire season as soon as it becomes available. For our full review of Cry Wilderness, simply click right here. I would close by saying to keep “circulating the tapes,” but it’s probably about time to retire that expression. Instead: Introduce a friend to MST3K! Watch the new season! Watch the classic episodes on Netflix! Share them with new converts! Read our content about the series on Paste! And remember to be thankful for the fact that one of the best cult TV series ever has returned when we needed it most. Jim Vorel is a Paste staff writer, and resident MST3k geek. You can follow him on Twitter for more MST3k content.